Because of my 15+ years in cyber security and roles in cyber security management I am often asked about career development and ideas on ways to advance their positions to CISO-level jobs. I often suggest looking at certifications and experience as being the best starting points; however, I recently came across a really useful document from the Small Wars Journal written by Gregory Conti, James Caroland, Thomas cook and Howard Taylor. 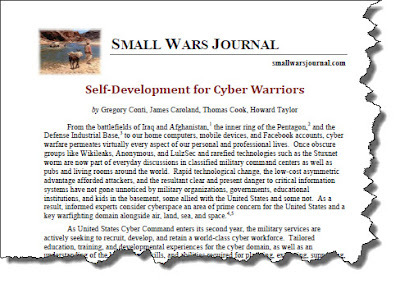 In 2011, Conti, et al wrote Self-Development for Cyber Warriors (screen shot above). 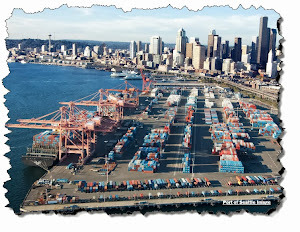 You can download the full article at http://smallwarsjournal.com/sites/default/files/893-conti.pdf . Although this is intended for current military personnel advancing in the US Cyber Command there are many good -- no, EXCELLENT -- ideas written down to guide someone to becoming a smarter and more valuable cyber security professional. Starting on page 26 the authors provide five different "Self-Development Roadmaps" for military officers and NCOs in different stages of their cyber careers. Regardless of the focus on the military career elements, the Roadmaps offer some great ideas for the new cyber student up to the more seasoned cyber expert. You may want to look over the Roadmaps for ideas and then build your own. Overall, I wish I had this resource when I was just starting out in the field. And, even though this was written in 2011, the guidance is timeless and can provide a super foundation for your and your cyber-co-workers' career growth. Well done to Messrs. Conti, Caroland, Cook and Taylor! Thanks for the contribution to the cyber society!